The Deseret Alphabet came about on January 19, 1854 when the Board of Regents of the University of Deseret, now the University of Utah, announced that they had adopted a new phonetic alphabet. The new alphabet consisted of 38 to 40 characters and was developed mostly by George D. Watt. George D. Watt was on a committe called by President Brigham Young, second President of the Church of Jesus Christ of Latter-day Saints, as part of a project to help simplify spelling in the English Language. Four books were published in the late 1860s using the Deseret Alphabet, Deseret First and Second Book Readers, the Book of Nephi Part 1 (1st Nephi through the Words of Mormon), and then the entire Book of Mormon. Various articles were also published in the Deseret News using the alphabet during that time. 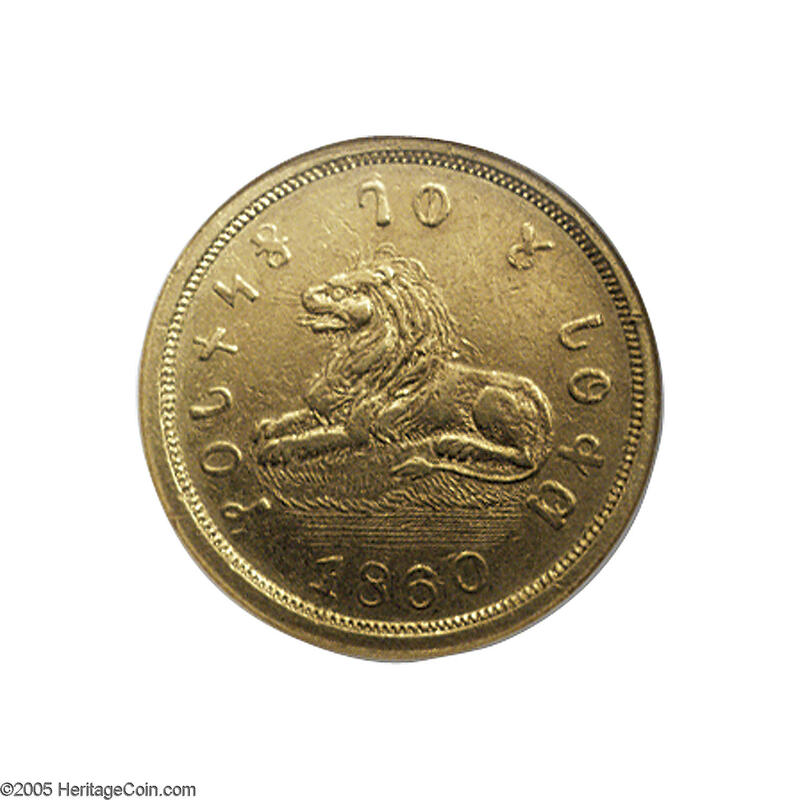 Even a gold coin (Image courtesy of Heritage Auctions) minted in Utah in 1860, included some lettering in the Deseret Alphabet. Despite being heavily published by the Deseret News and promoted by President Brigham Young, the Deseret Alphabet never gained wide acceptance. Soon after Brigham Young's death in 1877, resources and funding of the project came to an end. The Deseret Alphabet is now used mostly by hobbyists and studied by historians as it preserves the way the English language was spoken in the 1860s in Utah. For anyone wanting to learn to read and write in the Deseret Alphabet, "A Complete Guide to Reading and Writing the Deseret Alphabet," by Neil Alexander Walker is a good place to start. courtesy of The Church of Jesus Christ of Latter-day Saints. The Internet Archive also has very nice scans of these books, plus some other interesting documents. The Church History Library and the Internet Archive recently made available a complete scanned copy of the 1869 Deseret Alphabet edition of the Book of Mormon here. The Book of Mormon, Doctrine and Covenants, and the Perl of Great Price (Triple Combination) in the Deseret Alphabet is available here Triple.pdf, in PDF form, courtesy of John H. Jenkins. The Huneybee font, a freeware True Type Deseret Alphabet font used by this site and many others, is available at Huneybee.ttf, courtesy of Central Hub. A lot of us that are interested in the Deseret Alphabet are now hanging out on Facebook at Facebook Deseret Alphabet Group or the Deseret_AB group over at Yahoo! Groups. Come join us! In late 1996, John H. Jenkins of Apple proposed that the Deseret Alphabet be included in the Unicode standard. His proposal was quickly accepted and in 2001 it was incorporated into the Unicode 3.1 standard. It included the 38 characters that were used to print the 4 books in the Deseret Alphabet in the late 1860s. Ken Beesley of Xerox proposed in a Unicode Conference in 2002 that because earlier version of the Deseret Alphabet sometimes included 40 characters, that the Deseret Alphabet in Unicode be augmented to include 2 more characters to represent the 2 extra characters that were used. It was accpeted and the 2 extra characters are present in the current Unicode 4.1 standard. The current Unicode chart for the Deseret Alphabet, in positions 10400 to 1044F, can be found at http://www.unicode.org/charts/PDF/U10400.pdf. To see if your browser supports the Deseret Alphabet in Unicode, you can go to http://www.unicode.org/standard/translations/deseret.html. It is a transcription of the "What is Unicode?" page found at http://www.unicode.org/standard/WhatIsUnicode.html, and if your browser supports it you'll see the page in the Deseret Alphabet. Mac OS X comes with support for the Deseret Alphabet in Unicode. "A Complete Guide to Reading and Writing the Deseret Alphabet," Chapter 1, by Neil Alexander Walker. The Church of Jesus Christ of Latter-Day Saints was founded in New York state on April 6, 1830 by the Prophet Joseph Smith. As a youth, Joseph had seen a vision of God the Father and Jesus Christ wherein he was told not to join any other church. Later, as a young man, he was visited by an angel named Moroni who told him of an ancient record on plates of gold hidden in the hill Cumorah. The record, he was told, contained an account of extinguished peoples who once inhabited the New World and their dealings with God. Years after this experience, Joseph Smith was allowed to go to the hill Cumorah and obtain the plates of gold. The Prophet labored for weeks and translated the record by the gift and power of God. The translation, published in Palmyra, New York in 1830, was entitled The Book of Mormon. The remarkable story of Joseph Smith and his strange new book of scripture attracted a great deal of interest and many converts. They also attracted enemies. By the 1840s, Joseph Smith and the members of the church he had founded had been driven across the American states of New York, Ohio, and Missouri to the swampy shores of the Mississippi in Illinois. Along the great river, the Mormons, as the members of the Church had come to be known because of their belief in the Book of Mormon, erected a city of brick and stone they named Nauvoo (based on a Hebrew word meaning beautiful). Nauvoo had a population of thousands and became one of the most important cities in Illinois. The Mormons built a beautiful temple of carved stone atop a hill and had farms and businesses. The Prophet's beautiful city was not to last. Angry and jealous neighbors organized themselves into mobs and began to attack the Mormons. Eventually, Joseph Smith and his brother, Hyrum, were brutally killed in Carthage jail while awaiting trial on false charges. With the prophet's death, The Church of Jesus Christ of Latter-Day Saints was expected to dissolve. Rather than dissolve, the church continued to grow. Before his martyrdom, the Prophet had organized a quorum of twelve apostles. Brigham Young was the president of this quorum and took control of the church. President Young realized that its persecutors would not allow the church to continue in Illinois or anywhere frequented by others. He led the main body of the church on a long and difficult journey of over 1,000 miles across the Great Plains and the Rocky Mountains to the Great Basin in what is now Salt Lake City, Utah. Once established, Brigham Young sent groups of Mormon settlers throughout the west to strengthen the church's presence in the region. Eventually, President Young would personally order the establishment of more than 350 settlements from San Bernardino, California to Idaho. The LDS settlements were organized according to a pattern first set out by the Prophet Joseph Smith. Each town was to have streets laid out in a grid with a space set aside for a temple in the center. The Mormons supported themselves in the arid lands through the use of irrigation and hard work. At first, this collection of desert lands and small Mormon settlements was named the Territory of Deseret. President Young ruled Deseret as something of a theocracy for a time before congress rejected it as a territory and created the smaller territory of Utah (with Young as governor). 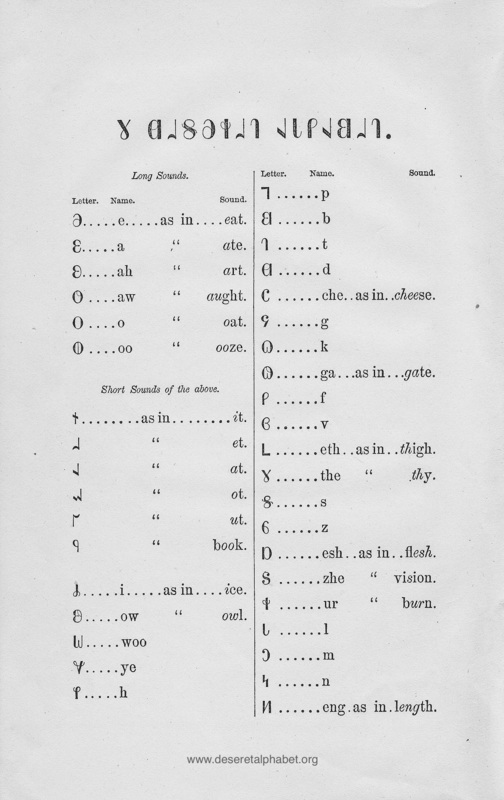 It was amid this unique social experiment that Brigham Young and his closest associates decided to create and promulgate a new alphabet for English. George D. Watt, the first English convert to the LDS church, had been a student of Pitman shorthand in his native England. He thus had a good understanding of the individual sounds (the phonemes) of spoken English. President Young chose him together with other leading churchmen to design a completely new alphabet for English which would have a letter for every single sound of the language. The alphabet went through many versions and revisions between 1854 and its eventual abandonment in the 1870s. The total number of letters changed as did their shape. At first, the so-called short vowels were to be smaller than the other letters. Early examples of the Deseret Alphabet show it to be very fluid and appropriate for cursive script. Eventually, the Regents of the University of Deseret (now the University of Utah), who were responsible for promulgating the script, created a standard version with 38 letters. This version was used in four books: two reading primers (The Deseret First Book and The Deseret Second Book), a selection from the Book of Mormon (The Book of Nephi) and The Book of Mormon in its entirety. In addition to the four printed books, less polished versions of the alphabet were used on some gravestones, store signs, a gold coin issued by Young for use in the territory, in over 70 newspaper articles in the Deseret News (mainly scripture quotations) and in numerous personal journals (including a journal from a mission to the Hopi Indians). Contrary to the assumptions of outside critics, who have claimed that this alphabet was intended to cloak LDS writings from Gentile view and further isolate the Mormons in their mountain retreats, the Deseret Alphabet was intended solely to ease the burden imposed upon students learning to read and write English. Thousands of new converts were pouring into Deseret for whom English was a new language. A new alphabet with better sound to symbol correspondence could only help these new members learn the English language. Observers at the time recognized that the new alphabet was in the same tradition as those of Pitman in England. Far from being an attempt to hide things, every appearance of the alphabet in print came with an accompanying table of letter values for all to see. Unfortunately, the members of the LDS church never fully accepted the new alphabet. Reasons given for the alphabet's failure include the oppressive cost of reprinting extant literature into a new script for an impoverished people and the esthetically poor shapes of the letters. In particular, the final version of the Deseret Alphabet has been criticized for lacking ascenders and descenders (letters which rise above or fall below the line like b and p). By the time of Brigham Young's death in 1877, the Deseret Alphabet had been abandoned. All told, the LDS church spent thousands of dollars (at 19th century prices) and man-hours trying to create and implement a new alphabet. Nevertheless, a new alphabet was created. The script has survived despite its failure as a practical medium of written communication. Brigham Young's Deseret Alphabet exists in the 21st century mainly as a historic curiosity for descendants of early Mormon pioneers and language aficionados. Recently the script has been included in Unicode and some internet sites. Interest in the script continues today and might be greater now than when it was actually in use in the nineteenth century. Reprinted with permission from Neil Alexander Walker. The full paper can be found here. It is an excellent paper and includes an analysis and guides for reading and writing the Deseret Alphabet. Deseretica - A blog devoted to the Deseret Alphabet. Deseret Language and Linguistic Society Symposium - The BYU College of Humanities sponsored an annual DLLS Symposium from 1975 to 2001. Facebook - Facebook Deseret Alphabet Group. LDS Living - Why Brigham Young Commissioned a "Mormon Alphabet"
The Deseret Alphabet Experiment - The Deseret Alphabet Experiment by Richard G. Moore. Tseng-tsz Deseret Alphabet Blog - Tseng-tsz's Deseret Alphabet Blog. Writing in the Deseret Alphabet - Writing in the Deseret Alphabet by Michael Elliott. XKCD in the Deseret Alphabet - The XKCD webcomic transcribed into the Deseret Alphabet.